This train inspector will optimize productivity and ROI overnight. Drivable from either end, no turnarounds are required to face the direction of travel. The high platform puts you at the perfect height to immediately access rail cars. Handy controls and automatic dynamic braking allow for quick and safe start-and-stop operation. 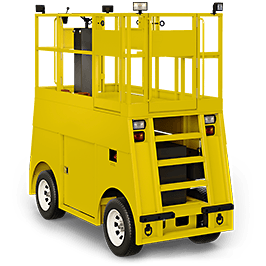 This low-maintenance vehicle boasts a all-steel unibody construction, rugged water-cooled diesel engine, hydrostatic transmission and dual hydraulic wheel motors. Optional seat for long trips.